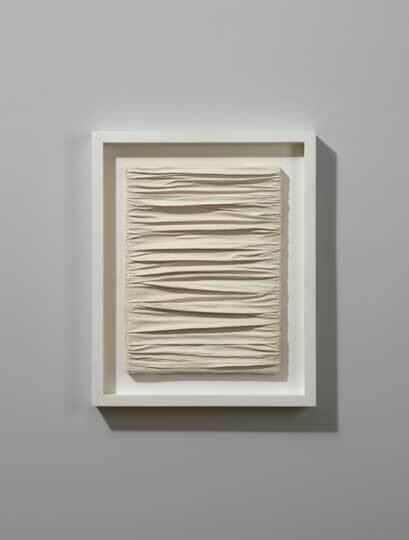 ‘Abstract white relief’ is not an easy term to get your head around. It can sound highly technical, or positively poetic: three slight and airy words that threaten to float away like a balloon as soon as they are said. Yet this simple sensation of transcendence was precisely the intention of many of the artists who used abstraction and whiteness to transform the ancient medium of relief sculpture during the 20th century. They sought to turn an object in the physical world into a window through it. A new exhibition at the Dominique Lévy Gallery in London charts the ghostly progress of the abstract white relief through the work of 18 different artists, from the 1930s to the ‘70s and beyond. The show is titled ‘Sotto Voce’, although there is not so much a voice in these works as a sort of visual static – impersonal, monotonous and often unsettling textures and rhythms, with the occasional burst of violence. And they are all white: one cold white artwork after another, set against walls of pigeon grey to amplify their subtle three-dimensionality. You could, if you were so minded, construct a narrative here, and that would be more or less the narrative of 20th-century art. Two bookends present themselves. On one side is the earliest piece, Henri Laurens’s plaster relief Deux Femmes (1930): here we see the last refuge of the human figure en route to abstraction, its body spread into angular forms and its head, literally, effaced. On the other side, Mira Schendel’s Untitled (XII) from 1986: two white planes and a thin strip of black acrylic paint – all that remains of the relief is a shadow, an idea. In between the two is a dense web of iconic gestures and interconnected artistic movements, so characteristic of modernism. After Laurens the human figure disappears from the exhibition. In the work of Jean Arp it is dispersed into an arrangement of vaguely organic shapes, like Cubist body parts spread on a table. 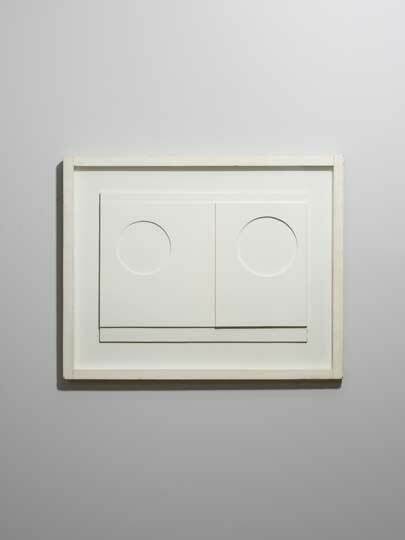 The early reliefs of Ben Nicholson, on the other hand, replace nature altogether with circles, squares and rectangles. Aesthetically speaking, the different approaches of Arp and Nicholson to the abstract white relief can be traced like parallel paths into the heart of the century. Arp’s curvaceous approach, still suggestive of life, can be felt in the Achromes of Piero Manzoni – tactile patterns made by the action of kaolin on canvas – or in the furtive curling of wire in Pol Bury’s Erectile (1959). 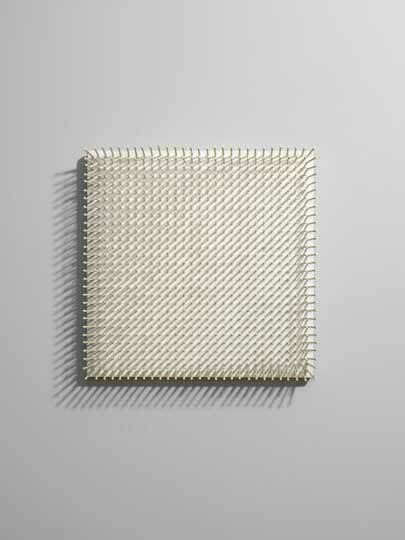 The colder geometric lines of Nicholson can be traced to Günther Uecker’s prickly square of white nails (Untitled, 1967), or the angular monoliths of Sergio de Camargo. But ‘Sotto Voce’ itself does not suggest any such narrative, nor does it privilege any great works. In fact, there is no information at all on the walls, no chronological order, and where there are two works by the same artist they are separated from each other. This is mischievous curation, since in many instances works from different generations, continents and artistic backgrounds appear similar enough to be mistaken for each other. 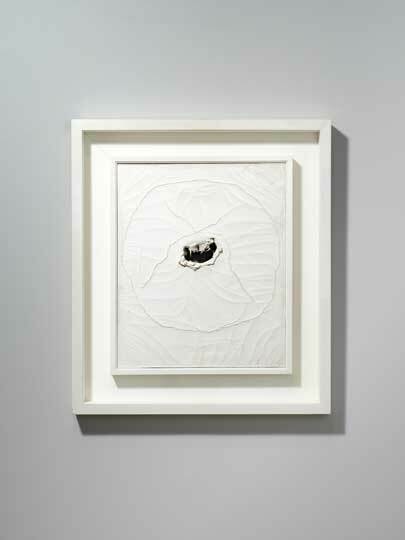 But paradoxically this lack of organisation reflects more honestly the history of the abstract white relief. The medium did not progress along simple lines of influence, but acted instead as a gravitational force that achieved critical mass in the middle of the century, attracting artists to the power and simplicity of this aesthetic gesture. 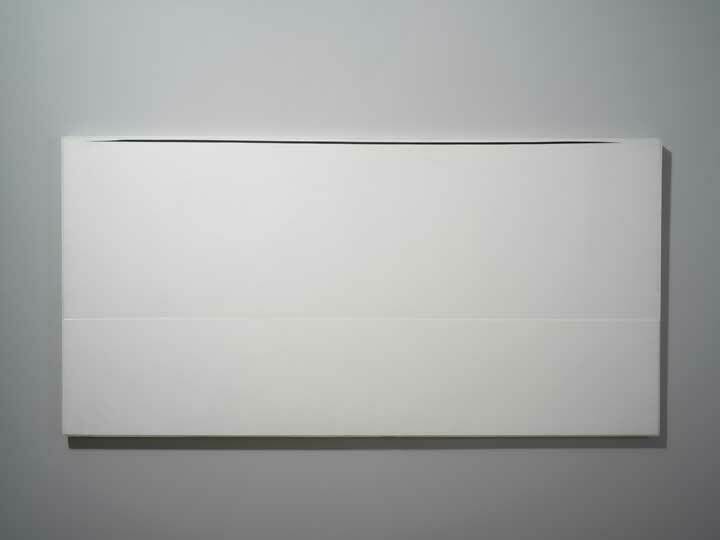 Abstract white reliefs cropped up across Western Europe in avant-garde groups such as Nul and Group Zero, who cross-pollinated and formed an extended network with artists in North and South America, eventually laying the ground for Minimalism and, to an extent, Conceptualism. Yet, it remains tempting to say that this exhibition has a centre, and that is the yawning abyss of Lucio Fontana’s slashed canvases from the seminal ‘Concetto spaziale’ series, made during the 1960s. 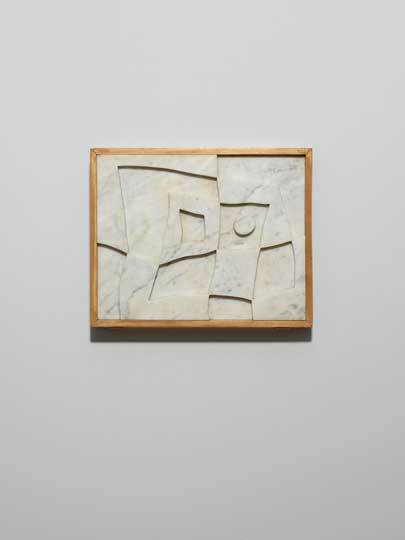 Not only was Fontana’s stark new dimension symbolic of the movement away from the picture and towards the mental act, his accompanying discourse of ‘the void’ – which he spread personally across continents and generations – describes the appeal of the abstract white relief. That was an appeal of escape, from the daunting questions of post-figurative art, and from the brutality of mid 20th-century history more generally. Its essence is vagueness and distilled optimism: Fontana spoke of man as ‘pure spirit’, and of a ‘philosophy of nothing’, which was, however, ‘a creative rather than a destructive nothing.’ This language makes itself broad enough to capture the anxiety of the contemporary zeitgeist, while simultaneously offering the sense of a blank state, a fresh start. Whiteness and abstraction were tools for the ritual scrubbing away of a complicated and compromised physical world, leaving a medium whose raised, textured or punctured surfaces invited the consideration of something – anything – more pure beyond. ‘Sotto Voce’ is at Dominique Lévy Gallery, London, until 18 April.